It sounds like a cliche startup — the kind of pitch that would make an investor cringe. 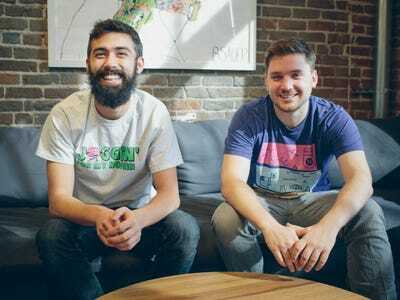 But TeeSpring, a startup that helps designers crowdfund T-shirt ideas, has had such strong initial traction, it just raised $US35 million from top Silicon Valley firms Khosla Ventures and Andreessen Horowitz. Khosla’s Keith Rabois is joining TeeSpring’s board. CEO Walker Williams says his product has already turned 10 people into millionaires by helping their T-shirt ideas go viral. 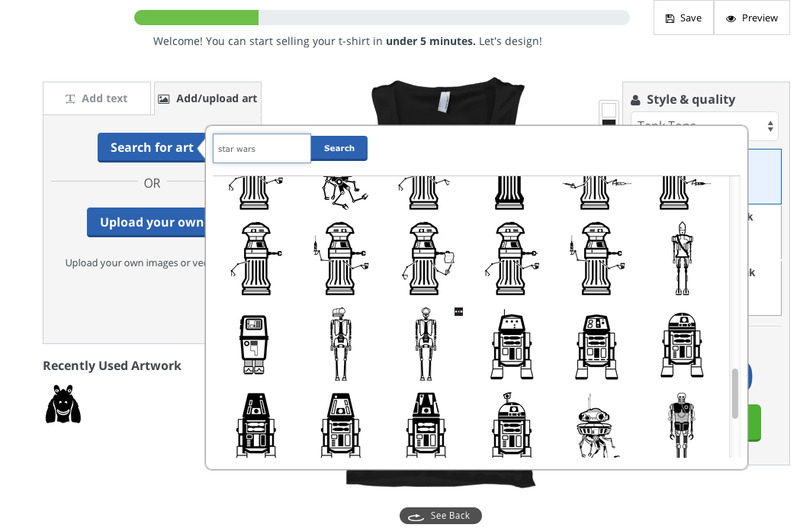 Simple tools on TeeSpring’s site allow design novices and pros alike to upload T-shirt ideas and slogans. The designers can select which quality and type of shirt they’d like to print on (American Apparel versus Hanes, and a hoodie versus a tank top). There are a bunch of fonts and icons to choose from. 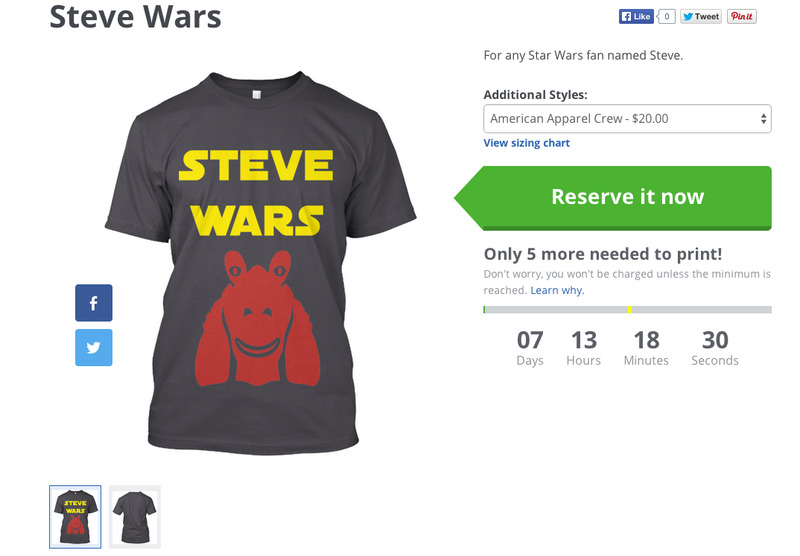 The creator then selects how many T-shirts they think they can sell and sets a goal. 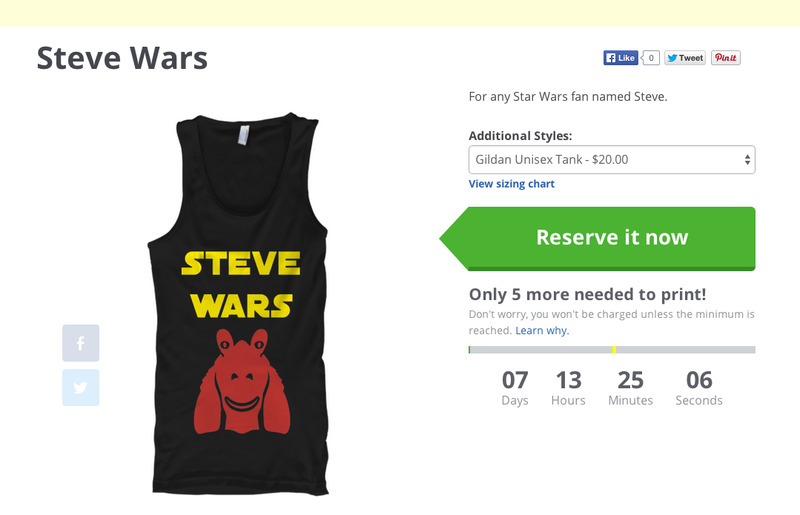 If at least five T-shirts are pre-ordered, TeeSpring will produce the items and ship them directly to customers. TeeSpring shows you how much you’ll make if you hit your sales goal. 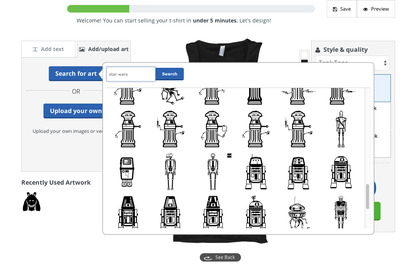 You can add multiple T-shirt designs to sell too. Then you type in your shirt’s description and give it a unique URL. There are share tools to help you spread the word about your shirt. TeeSpring will also help target ads to your designs to improve sales. Tada! 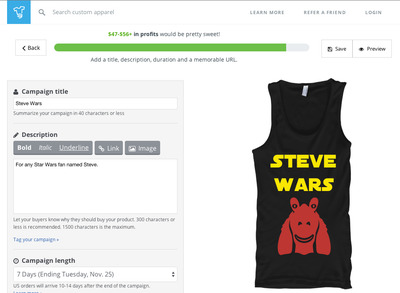 Your shirt has been made, and the campaign has begun. All campaigns last 7 days. We madethis sample designfor Business Insider reporter Steve Kovach, who’s a big Star Wars nut. Teesspring gets rid of excess inventory by creating demand before a shirt is produced. For anyone who’s ever had a T-shirt idea and tried to sell it, you know the process is painful. First, you have to find a local printer and a wholesale T-shirt provider to order from. You’re forced to order at least a dozen or two items, even if you’re not sure your slogan will sell. Then it takes a few weeks to perfect the design, send it to the printer, and get the items made. It takes more time and a lot of money (around $US100 bucks) to get that many shirts shipped to your door. Then you have to turn around and ship them to customers. Teespring does all the work for you. All you need to do is come up with an idea and help market it via social media and word of mouth. It’s not clear how decent the margins on Teespring’s business are since they have to split every sale with the t-shirt designer. And t-shirt designers can make a lot more money producing the shirts yourself. But if you want a painless way to make a few bucks, it could be a decent solution. Most other easy we’ll-make-it-for you solutions like BustedTees or CafePress offer a set fee for your design, and few or no proceeds later if it goes viral. They also don’t help you assess demand before you create a shirt. Teespring was founded by two Brown graduates, who were frustrated when they tried to make a T-shirt in college. Brown’s local dive bar, Fish Co., was being shut down. The founders, Walker Williams and Evan Stites-Clayton, wanted to create awareness for the bar and rally fellow students to save it. The pair created a Facebook post for titled “Free Fish Co.,” which quickly racked up a lot of likes. When they tried to get the shirts produced quickly, they ran into the typical T-shirt production snag. Their idea couldn’t be turned around quickly, and they didn’t have the funds to produce a bunch of shirts without knowing how well they’d sell. Stites-Clayton and Williams spent six hours building their own website for the T-shirt. Within a day, the shirt had gone viral in the Brown community, yielding hundreds of pre-orders. “We got more visits to the website than there were students at Brown,” Williams tells Business Insider. Other students noticed the campaign and asked Williams and Styles-Clayton to build them similar websites for their T-shirt ideas, and their business was born. 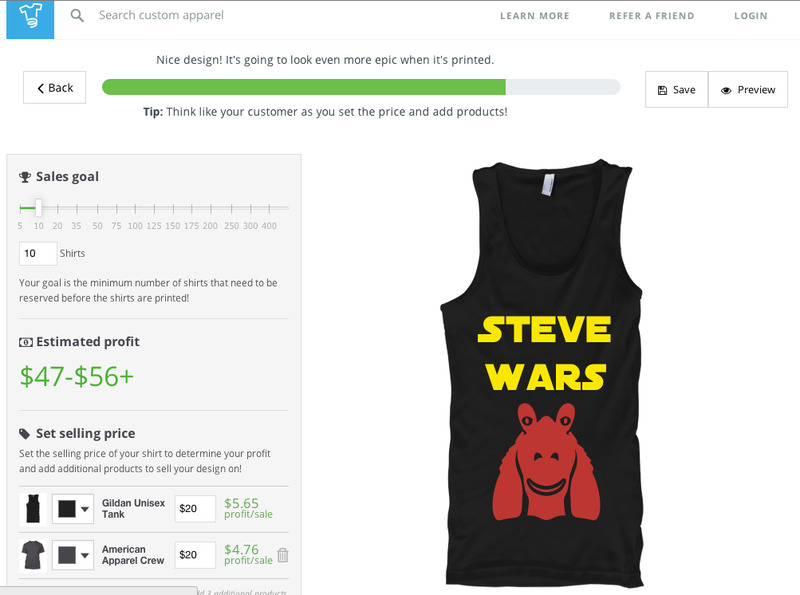 Now, Teespring has shipped more than 6 million products. It’s using a big chunk of the $US35 million to build a printing facility in Kentucky where all of the shirts can be produced and shipped quickly. Williams anticipates Teespring will create 300 jobs there over the next year.